I love JSimpson's version. The black inside appeals to me rather than the silver in the Weitzman shoe. Oh, the low heel! It was foretold it would make a comeback and I'm so glad it did. Love the kitten heel. Probably go for the cheaper. I'll take the J. Simpson ones! I like the jessica simpson pumps. Totally same. I love them! I actually prefer the heel of the Jessica Simpson pair much better... A good thing for my wallet! I'd go with the JS ones. They're so similar! What a fantastic match! The heel isn't quite high enough for me -- I generally prefer 4 inches or more -- but these are cute! I'm not usually a fan of kitten heels (I love heels very high), but the Jessica Simpson ones do look really fab. i'd definitely go for the jessica simpson ones, they look great! wow so similar. I'm glad Jessica likes shoes. I love the SW's...so gorgeous! It's amazing how similar they are! I'd spend more just b/c JS irritates me. oh! cute shoes!!! i love them erika!! I'll go with Jessica on these! I have a pair of her shoes and I heart them! Those shoes are bot so cute. I like the skinnier heel of the Stuart Weitzman, but I think the Jessica Simpson ones would be easier to walk in. i think these look a bit different, so it might be good to get both. if only i could wear heels these low. Jessica S. are so nice. I love the Jessica Simpson shoes! Great find! WHoever designs J. Simpson's shoes deserves a lovely award. I have yet to see a shoe of hers that i do not love. I always love the look of high heels, but a low heel is definitely nice to have. They are a little bit nicer to my feet. I actually really like both of these shoes, tough call! But I'll probably go with the Jessica Simpson ones. I love the Stuart Weitzman shoes. I jut don't think I would pay $335.00 for such a non-WOW shoe! Kitten heels are really cute, aren't they? Either of these would look cute with a pair of slim jeans, rolled up a bit at the ankle, don't you think? i might go with neither!? Price aside, I think I actually prefer the JS heel because of the larger width at the top of the heel. I know, so minor, but I just like it better. :) Another great find/comparison post. I'm loving the Jessica Simpson pair! 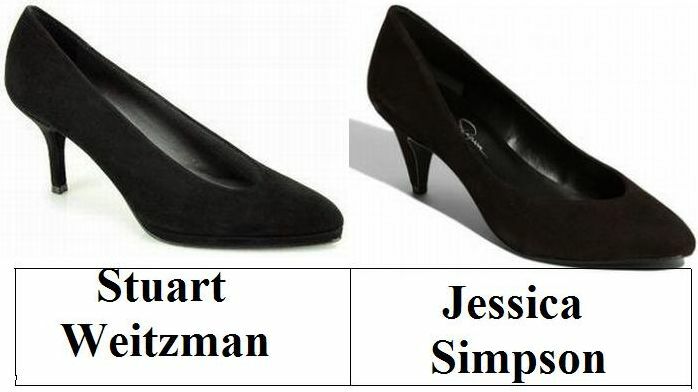 jessica simpson all the way! i love her shoes. regardless of tightwad or spurge, I love the Jessica Simpson heel. It's got a beautiful mod look. Wow, how can it be that I like the Jessica Simpson version? This is Simpson we're talking about! I never like anything of hers!